Squawks's Shaft is the tenth level of Donkey Kong Country 2: Diddy's Kong Quest. It is the fifth area of Crocodile Cauldron. 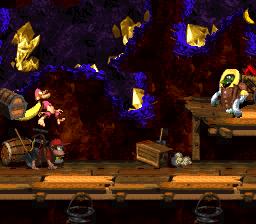 As the level's name implies, Squawks's Shaft takes place inside of a mine shaft, and Squawks the Parrot (in his first playable appearance) can be found throughout the second half of it. Krooks make their first appearance in this level, and they, along with a large amount of Zingers, try to defeat the Kongs throughout the whole level. Other enemies include Klomps, Kannons, and Klampons. During the first half of the level, the Kongs must dodge many of these enemies while traveling upwards with the use of many Barrel Cannons and Auto Fire Barrels. In the second half of the level, Squawks must lead Diddy and Dixie Kong upwards to the top of the shaft, while dodging additional enemies. The Kongs prepare to shoot out of a Barrel Cannon. 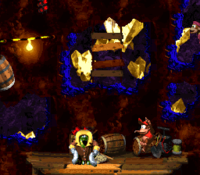 The Kongs begin the level on a platform next to a treasure chest that contains the letter K. A raised platform is ahead of here that holds a Krook, who stands under a trio of bananas. 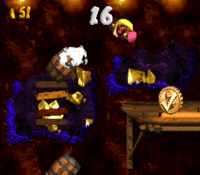 At the edge of the starting platform, the heroes can find a Banana Coin with a platform above it that holds a Klomp. They can find a Barrel Cannon above here that they can aim to blast them towards a few small platforms that they must climb to reach a long platform, which supports three Klomps and a DK Barrel. Two more platforms are to the left of here, and they both hold Krooks. A Banana Bunch is to the left of the second platform, which stands below a Barrel Cannon that can blast the heroes to a group of three platforms. They must climb to the top platform to find another trio of Klomps and a Barrel Cannon. If the primates roll-jump to the right of here, they can find a hidden Barrel Cannon that can fire them into another Barrel Cannon that is surrounded by Zingers and a Bonus Barrel. If the Kongs blast through the non-hidden Barrel Cannon, they can reach an additional barrel, which is able to blast them onto a long platform with a slightly smaller platform above it. Krooks are on the ends of both of these platforms, and the Krook on the lower platform guards a Banana Bunch and a treasure chest that contains a red Extra Life Balloon. A smaller platform is located to the left of these enemies, and a Dixie Barrel is above it that can blast the heroes towards some more Barrel Cannons. These cannons can shoot them into many bananas, two Banana Coins, and, in the Game Boy Advance version of the game, a Golden Feather. If the heroes travel east from here, they reach a Barrel Cannon that they must aim to blast them upwards, where there are two more cannons that they must shoot through to progress. As they blast between the last two of these barrels, a Zinger tries to get in their way and flies back and forth between them in a horizontal path. The third barrel in this area is able to blast the two friends to a pair of small platforms that carry one Klampon each. A Barrel Cannon floats next to the platforms, and it can blast the heroes towards several more Barrel Cannons. As they shoot through these barrels, they come up to a Zinger that they must avoid and many bananas. Eventually, they make their way onto a platform with a Star Barrel above it and an Auto Fire Barrel that can blast them to a Bonus Barrel to the left of it. Squawks shoots an egg at a Zinger. To the right of here, the duo can find a small platform with a Barrel Cannon above it. The cannon is able to shoot them past a pair of Zingers that move parallel to each other and then to another Barrel Cannon, which can then send them to a platform. This platform supports a Krook, who guards the letter O. An additional platform is to the left of here, and it holds an Animal Crate that contains Squawks the Parrot. After the heroes free the parrot, they must grab onto to him so that the bird can lift them through the remaining part of the level. As the heroes begin to ascend, they come up to a DK Barrel in a small gap between two platforms. Above these platforms, the heroes can find a group of bananas that form the letter Y (or the letter B in the Game Boy Advance version of the game). Some more platforms stick out of the side of the area on the way up this part of the level; the first platform holds a yellow Zinger, the second holds a red Zinger, and the third carries a Krook. These three platforms are followed by a group of Zingers that consist of two stationary red Zingers that float under the letter N and two yellow Zingers that hover next to their allies. Three additional platforms are above here, and they all hold one Krook each. A DK Barrel is located just above the third platform, and it is followed by a few Mini-Neckies that swoop down at the heroes to attack. 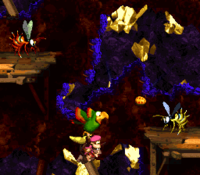 After the group passes these small vulture enemies, they come up to four platforms that stick out of the wall. Two of these platforms, which are positioned across from each other, hold Krooks that both throw their hooks at the heroes. To the right of these Krooks, the heroes can find a Banana Coin and a hidden area that contains another Krook on a platform, two groups of bananas that form arrows pointing upwards, a Bonus Barrel, and a DK Coin. If the Kongs and Squawks continue upwards from the location of the previous two Krooks, they reach a platform with a Kannon on it. The heroes must pass under this enemy to progress, but as they do so, they must watch out for the kannonballs it shoots at them. Once the group passes this foe and heads farther upwards, they reach a pair of red Zingers moving back and forth in a horizontal path around a Banana Bunch. A few more Mini-Neckies are ahead of here, and once the trio continues past them, they reach long platform that holds a No Animal Sign. If they pass the sign, Squawks disappears and they are given a Banana Bunch. An End of Level Target is near here, and the Kongs must jump on it to complete the level successfully. Additionally, the Kongs can win a prize from the target if they hit it immediately after shooting out of a nearby barrel. K: The Kongs find a treasure chest containing the letter K immediately after they being the level. They must throw the chest at an enemy to open it. O: The letter O is located behind a Krook found immediately before Squawks's Animal Crate. N: Shortly after the heroes find Squawks, they come up to a pair of red Zingers with the letter N above them. G: The letter G is one of the prizes given from the End of Level Target. At the end of the level, they must shoot out of a nearby Barrel Cannon to hit the target in order to earn a prize. The prize given depends on the time they hit it. The heroes shoot the Kremkoin at the end of the second Bonus Level. At the second part in the level where the Kongs discover three Klomps marching in a row, they must super-jump (or hover with Dixie's ponytail) to the right to reach a hidden Barrel Cannon. They must then shoot over a Zinger and into another barrel with this Barrel Cannon. Once they blast into the second barrel, they can find a Bonus Barrel to the right of them that is placed under a pair of Zingers. If they shoot into the Bonus Barrel, they are led to a Bonus Level, where they must search for a Kremkoin, which is hidden inside of one of the many treasure chests located throughout the area. They can break the chests by throwing them at a red Zinger in the center of the Bonus Level. The second chest in the right side of the area holds the Kremkoin, and once they break it, they can grab the coin. The heroes have 20 seconds to find the Kremkoin and collect it. The Kongs should travel to the left of the Star Barrel to reach an Auto Fire Barrel that can shoot them to a Bonus Barrel when they jump into it. The barrel sends them to the second Bonus Level, where they must shoot through several Barrel Cannons in order to reach the top of the area, where a Kremkoin is located. They have 25 seconds to find and collect this coin. On the Kongs' way up the shaft with Squawks, they can, after passing the letter N, discover two Krooks standing on separate platforms across from each other. The heroes must go in between the two of them and then move east past the Krook on the right to access a hidden area. A Banana Coin is located near this Krook to hint the primates that they must travel this way. In the hidden area, they can find a Bonus Barrel that is able to transport them into a Bonus Level, where they must fly through a mine shaft with Squawks while defeating eight Zingers to find a Kremkoin. If they defeat all of the Zingers within 30 seconds, the Kremkoin appears in the right side of the area of grab within the remaining time. The Kongs must discover the third Bonus Level, they must head east past a Krook found shortly after the letter N to access a hidden area that contains a Bonus Barrel. A DK Coin is to the right of the barrel. There is a secret Warp Barrel in Diddy's Kong Quest that is hidden in this level. To find it, the Kongs must start at the beginning of the level and head east to find a Banana Coin under a platform. The Kongs should super-jump (or hover with Dixie's Helicopter Spin) past the coin and over a pit to reach a hidden Auto Fire Barrel that can blast them farther to the right, where a Warp Barrel is placed. Upon being accessed, the Warp Barrel sends the heroes to a Bonus Level featuring bananas in the shape of an exclamation mark. If the primates exit the area, they appear at the end of the level in a Barrel Cannon located near the End of Level Target. Near the beginning of the level, the heroes should see two Krooks above and below each other on separate platforms. If they jump on the platform that holds the higher Krook and then hop onto the platform to the left of it, they can find a Dixie Barrel that can blast them to a Golden Feather and some other collectibles. Only Dixie Kong can enter this barrel, but it is too high for her to reach with a normal jump. Therefore, Diddy Kong must throw her into the barrel in order for them to reach it and be shot to the Golden Feather. Early on in the level, the heroes can find the second group of three Klomps in the level. One of the Klomps sports a camera icon above its head, meaning that it is in possession of a photograph. If they defeat this foe, they are given a picture of a Klomp for the first page of their scrapbook. Diddy Kong jumps towards a Krook in the original version of the game. Diddy Kong rides on Squawks in the Game Boy Advance version of the level. This page was last edited on April 6, 2019, at 01:52.